Downturn Yesterday - Upturn Today? Yesterday was a very down day at lower elevations in eastern Pima County - this trend was forecast by the various WRF model runs. The plot of detected CG flashes (above from Vaisala and Atmo for 24-hours ending at midnight last night) shows the doughnut hole of suppression centered on the Tucson metro area - yet again. Very quiet day across the Pima County ALERT network. From 5:00 am yesterday through 5:00 pm MST only 10 sites reported rainfall - these were mainly on the north slopes of the Catalinas and the south and east slopes of the Rincons (i.e., at the fringes of the network). 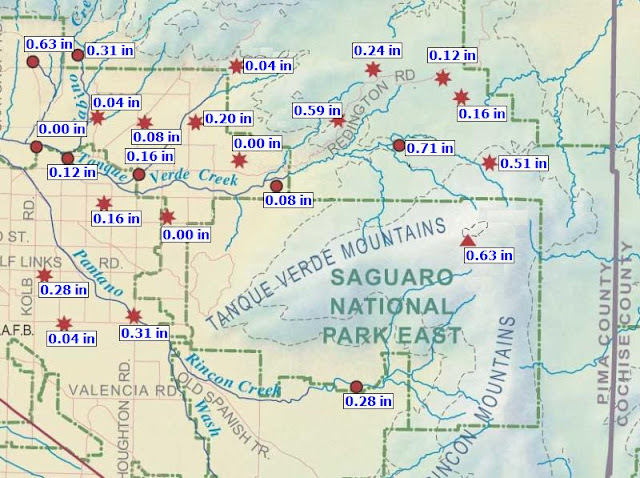 Heaviest amount occurred at the Cienega Creek gauge, southeast of Rincons - 0.91". During the night (5 pm through 5 am this morning) only 2 sites had rainfall. 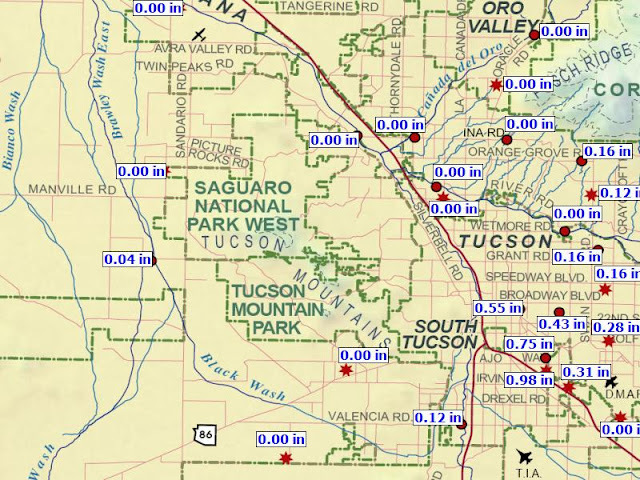 So the forecast POPs of 40% yesterday and last evening for the lower elevations of metro Tucson and the airport were considerably too high. There were several severe thunderstorms again in the Phoenix metro area with downburst winds and out at Gila Bend storms took down power lines and poles. The models have been indicating a bit of an upturn today, as drier air with the 500 mb Pacific trough and more moist air with the anticyclone remain in a stalemate across southern Arizona. The morning sounding from TWC (12 UTC skewT below from SPC) shows some increase in PW and definitely more CAPE today, but with light winds continuing, except above 300 mb. So main question will be whether or not thunderstorms can propagate very far off the higher terrain. Will wait to see what new WRF forecasts indicate before I get my hopes up for a final August rain event here at the house. As per the quite good WRF model forecasts at various times yesterday, there was indeed another upswing in thunderstorm activity yesterday - giving us four days now of an alternating up/down cycle. View above of Catalinas, from a drippy campus, shows how high-based the storms were. The 00 UTC sounding from TWC (below) was taken just before a strong outflow moved across metro area from the south (TUS had a high of 105 F a bit before 4:00 pm MST). The strong heating was an important aspect of yesterdays's storm environment, as the lack of coherent winds in the troposphere continued. The detected CG flashes (second below, from Vaisala and Atmo) through midnight last night show the marked increase relative to Friday and that the storms in the hot environment were fairly prolific lightning producers. A storm did drift in from the north here at the house yesterday afternoon, but produced only 0.06". Over the ALERT network 26 sites had rain (0.04" or more) between 5 am and 5 pm; between 5 pm and 5 am this morning 24 sites had rain; and for the 24-hour period 37 sites had rainfall. However, amounts from the high-based showers were generally light - only 10 sites had a quarter of an inch or more and just 4 sites had over half an inch. The storms did produce downbursts between here and the Phoenix metro area - reports at SPC included: power poles down near Picture Rocks and also up in Mesa; wind damage reports from near Florence, San Tan and Ahwatukee. The morning 12 UTC 500 mb analysis (above from NCAR RAL) shows the anticyclone centered over the White Mountains , with light winds over much of the Southwest. However, the west coast trough will increasingly dominate during the coming week, as September begins. Ups and downs in daily activity will continue; however, the wild card at play is the possibility of a tropical storm near or west of Baja by next weekend, This forecast feature in the global models ranges from being in the GoC to fairly far west of Baja - just something to keep in mind as the week evolves. This mornings sounding from TWC - below - continues little changed. No winds and CAPE down slightly, with PW continuing fairly steady. Shown at the bottom are two WRF-NAM forecasts of composite radar echoes. Top is from the 00 UTC run and bottom is from the 06 UTC run - both are valid at 6:00 pm MST late this afternoon. Main thing of note is that the models forecast another downturn for today, with only isolated storms over eastern Pima County. So, Mike's discussion re the new morning runs of the models will be of interest again today. Three hurricanes are strung across the eastern Pacific today - from east to west they are: Jimena Cat. 4; Ignacio Cat 4; and Kilo Cat 3. Intensities are current ratings. Image above is IR from 11 UTC this morning and current visible below for 21 UTC. The GPS PW has been trending slowly downward for the past 5 days (above is time-series at campus site ending this morning), and thunderstorm activity diminished greatly yesterday - below is 4:00 pm MST visible image from yesterday afternoon. My hope for a storm drifting south off the Catalinas was extremely wishful thinking. Here are two plots of CG flashes for 24-hour periods ending at midnight (from Vaisala and Atmo). Top is for yesterday and bottom is for Thursday. My eyeball estimate is that flashes decreased by about an order of magnitude, which is some change. Yesterday evenings sounding from TWC had no CAPE. I took a look at both the 00 UTC and 06 UTC forecasts from the WRF-NAM and both runs of the model continue to forecast a considerable increase in storms for this afternoon. Panels above and below are for accumulated rainfall through midnight tonight, with top being from 00 UTC run. The earlier run had more activity over eastern Pima County than did the midnight run. The morning sounding continues dismal with almost no winds aloft through most of the troposphere and only a sliver of afternoon CAPE. If the forecast increases in storms are to occur, we'll need some increase in PW from the west to northwest (where values are a bit higher) and perhaps some mid-level cooling. Will have to watch the morning forecasts and PW trends and nearby mountains for for midday buildups. Any guesses as to why Russ Scott has had to drape this flux tower with razor wire? 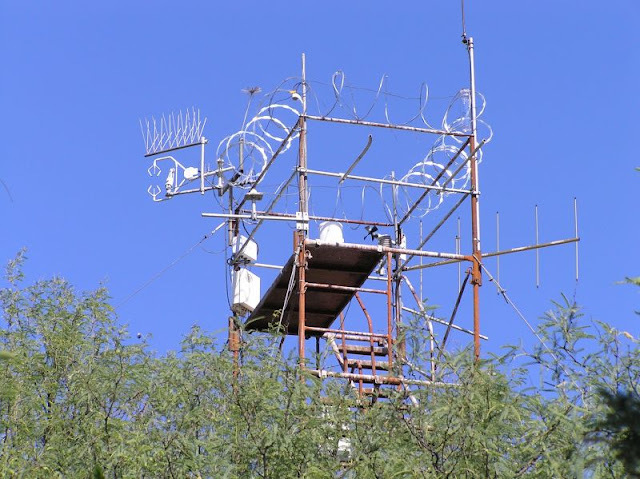 Russ says: I’ve gone to great lengths to try and make my tower uninhabitable (see picture) but the family group keeps coming back year after year. Stubborn, messy birds. There was an upturn in storm activity yesterday, particularly to the west to northwest of our area. Plot of CG flashes for 24-h through midnight last night is shown above (from Vaisala and Atmo). Biggest changes were out in western Pima County and across all of Maricopa County, where severe winds were common from Luke AFB area east to Roosevelt Dam. Here in the Tucson metro area storms developed late and focused on the east side of town, the Rincons, and Redington Pass area. There was thunder here at house and gusty outflows, but again, no rain. The composite radar chart below shows the situation a bit after 7:00 pm MST. Two sectors of the ALERT network data for the 24-hours ending at 5:00 am this morning illustrate the geographical coverage of the storms well. The metro W sector above was almost free of rain amounts of 0.04", while the metro E sector (below) had nearly 100 percent coverage with several sites having over half an inch of rain. Across the entire network 36 sites measured rainfall, but only 7 stations had half an inch or more, and no site measured three quarters of an inch. 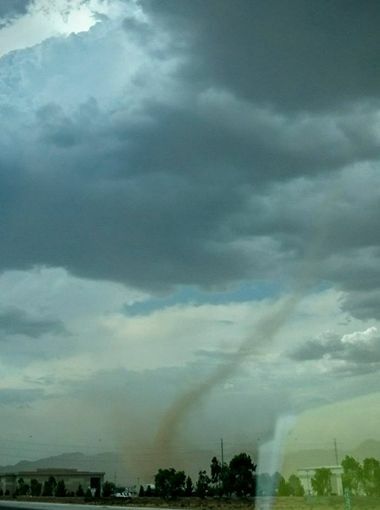 Photo below apparently shows a small, landspout type tornado in the Phoenix area yesterday afternoon - photo by L.W. Wilbrand taken in the Goodyear/Buckeye area. Luke AFB base measured gusts to 61 mph, while Sky Harbor airport had winds to 53 mph. Today seems to be yet another with only small changes happening in the large-scale setting. The 500 mb anticyclone is centered over southern California this morning and will shift back eastward during today and tomorrow. Winds in much of the troposphere are light and variable, and CAPE is down slightly here in the Tucson area. I looked at both the WRF-NAM and the WRF-GFS model runs from 00 UTC and also 06 UTC - all of those forecast runs indicate isolated mountain storms this afternoon for southeast Arizona. One of those runs forecasts a thunder storm over the east metro area during the late afternoon. I do think that the models may be a little conservative for this afternoon, since there are indications that mid-level winds will become light northerly and that there may be some slight bit of cool advection to increase CAPE relative to this morning. Would be a nice change if a storm drifted south from the Catalinas into this part of the city! There was a fairly substantial downturn in thunderstorm activity yesterday in eastern Pima County. The plot of CG flash locations above (from Vaisala and Atmo) is for 24-hours ending at midnight last night. Storms in our area stayed mostly on the mountains, with a large area devoid of lightning that stretched from Nogales across the Tucson metro, most of Pinal County and all of Maricopa County. 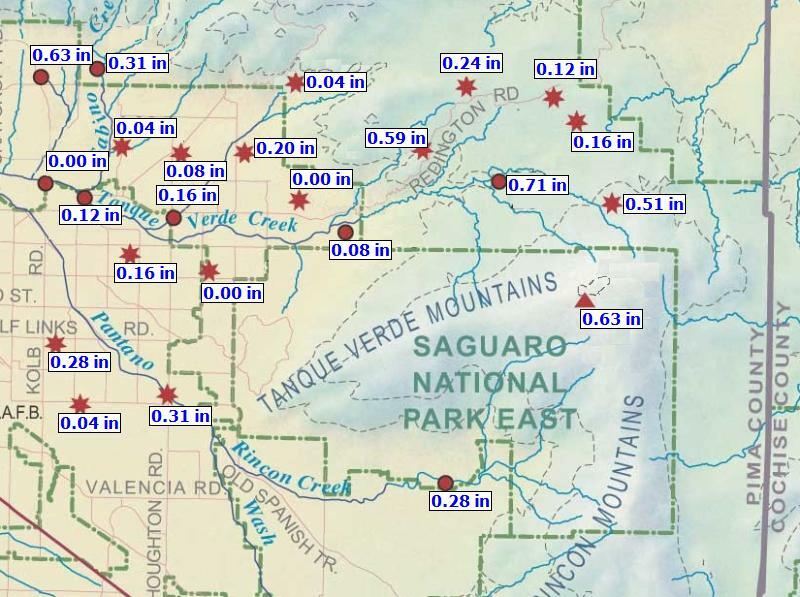 This was reflected by the Pima County ALERT network rainfall data - only 19 sites had rain through 5:00 am MST this morning and these were the higher elevation locations, particularly on the north side of the Catalinas and on the Rincons. Notable rainfall amounts were: Empire Peak 1.18", Mt. Lemmon 1.18, and Manning Camp 1.26". At 500 mb the anticyclone is elongated east-to-west and centered somewhere to our south. The models forecast the center to shift westward toward the Colorado River and then tomorrow toward the Four Corners. The visible image above is from 7:30 am and shows morning showers over higher terrain to our east and northeast - these are moving off toward the northeast. Morning sounding from TWC (below from SPC) remains a mixed bag. Wind profile has gone to hell below 300 mb, leaving little steering flow to move storms in any organized way. There will be some CAPE this afternoon, even with the warming above 500 mb. Upper-level winds may again bring anvil clouds over the Tucson area from the west to southwest, as happened yesterday. All-in-all a pretty mundane setting, but one that could again produce some locally heavy rains, particularly over the mountains. Tropical Storm Erika continues moving west-northwestward over the Atlantic, southwest of Puerto Rico (IR image above is from 1030 UTC). 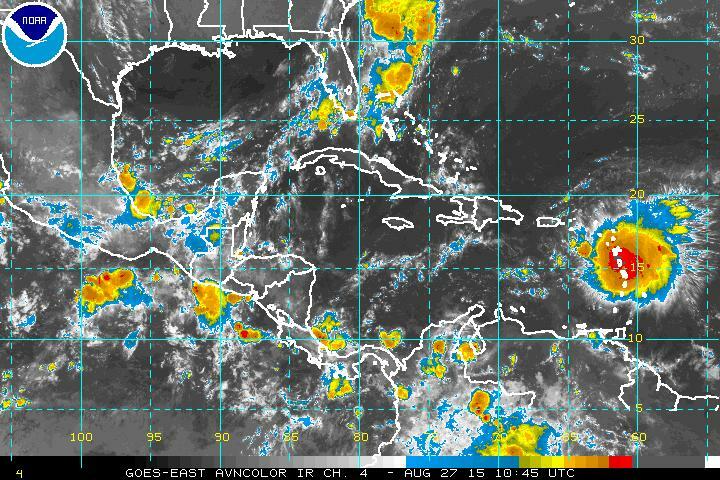 This morning's forecast from NHC (below) indicates that Erika will become a hurricane and then threaten Florida by early next week - so there will be much attention directed toward this storm as the month draws to a close. In the eastern Pacific Hurricane Ignacio is out near 140 degrees west and is moving off toward Hawaii. 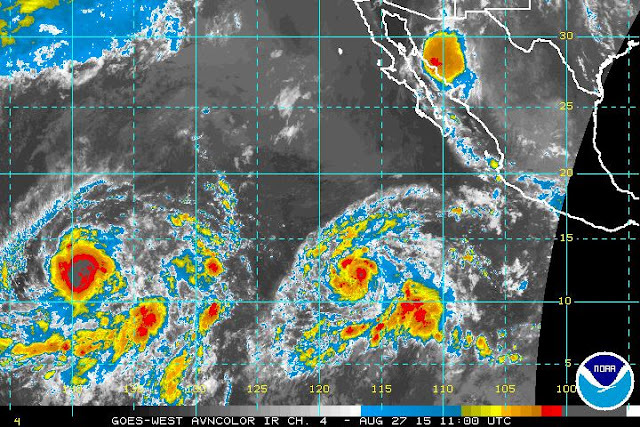 Tropical Storm Jimena is near 117 degrees west (IR image above from 11 UTC - note the early morning MCS over Sonora). Jimena is forecast to become a hurricane, and the graphic below indicates that both storms are expected to remain far removed from the Southwest. The morning showers across the metro yesterday put a damper on thunderstorm activity during the rest of the day. Although strong storms developed early and in all directions, they could not move far into the stable, metro environment. There were rumbles of thunder from decaying storms here at house, but only an additional 0.02" of rain. The plot of CG flashes above (from Vaisala and Atmo) is for 24-hours ending at 4:00 am MST this morning. Across the ALERT network 62 sites had 0.04" or more of rain yesterday, giving about 70% coverage. However, amounts were mostly quite light - only 6 sites had a quarter of an inch or more and two sites reported over half an inch. The small, circular cluster of flashes west-northwest of here was right over Marana. The airport up there (which has an AWOS3 automatic weather station) measured a gust to 59 mph and power poles and lines were down in the area. Today, the conditions have changed little - below is 12 UTC skewT plot for TWC (from SPC). Precipitable water remains around 1.50 inches, and there is some CAPE, but a layer of CIN remains to be overcome. The deep, southerly wind profile is not particularly good, since there continues to be threat of anvil shading over the metro area as storms again try to move northward - very strong storms might reach high enough to have anvil cloud trailing a bit behind storm cores, which would be good. There will be more sunshine this morning than there was yesterday, so that's a plus. Will just have to watch to see how this mixed-bag situation plays out. So much for suppression due to the early morning rain and clouds - heavy storms have developed rapidly this afternoon. there is a severe thunderstorm warning out for the Green Valley area. Here at house anvil cloud is already overhead and cutting down heating - will see if this keeps storms south or if they head into the City. Visible image above is from 1:30 pm MST and radar composite below is from 1:42 pm. An early am post - woke up at 3:30 am to distant lightning flashes (a bit like the Bob Seger lyrics) and saw that it was raining. Storms tried to move in last evening - photo above is from 6:30 pm looking toward Redington Pass. However, it was not very unstable over the metro area and storms weakened as they moved to lower elevations - composite radar below is from 8:30 pm MST on the 24th, when it was raining lightly here. Now the radar shows (above is for 3:30 am on the 25th) a wide rain and thunderstorm band across much of eastern Pima County. These echoes are moving northward, as the weak, inverted trough at 500 mb has apparently inched to our west. Satellite IR image below is for 3:00 am and indicates considerable cold cloud temperatures still with this band. So, quite a nice morning surprise. I just checked the ALERT data and found that, since 5:00 pm last evening, this has become essentially a 100% coverage event (only two sites at the far northwest corner of the network have not measured rain). Amounts appear to have generally been from a couple of tenths to nearly an inch at several higher elevation sites. The CG flash density plot at the bottom (from Vaisala and Weather.Graphics) is for the 2-hours ending at 3:45 am - showing the band of storms down here and also some thunderstorms up in Maricopa County. Needless to say, it will be an unusual summer day, with the widespread morning rain followed by what will likely be a suppressed and muggy afternoon. Finally, A Heavy Thunderstorm Here! 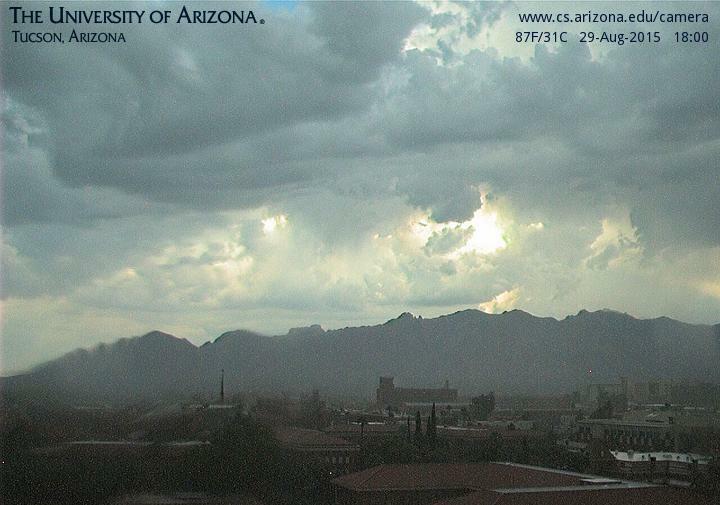 Photo above shows developing storm over west end of the Catalinas at about 3:30 pm MST yesterday afternoon (Sunday, 23 August). Once this storm moved out over lower elevations it quickly dissipated. The plot of detected CG flashes for 24-hours ending at 0830 UTC on the 24th (below, from Vaisala and Atmo) shows that thunderstorms mostly avoided the low elevation metro area, with the main activity from the north to west to south of Tucson. Across the ALERT network only 27 of 92 sites measured 0.04" or more of rain for 24-hours ending at 7:00 am MST this morning. The NWS had forecast highest POPs (50% at airport grid box) during period from 5:00 pm through 11:00 pm and this is indeed when most of rain occurred, with 25 sites having rainfall during that period. Amounts were generally very light, especially compared to Saturday's rains (compare the metro-west ALERT sector - second below, for the evening period - to the same sector for Saturday - earlier post). Only 4 sites had more than a quarter of inch. Heaviest amounts were 1.22" at Davidson Canyon in the far east part of the array and 0.94" at Avra Valley Air Park, on the far northwest side of the network. But big news here was that a small storm developed just to the northeast at dark and moved slowly southwestward across our location. This was a very small radar echo and did not directly hit any ALERT site. Here it produced several crashes of thunder, wind gusts to about 50 mph, and very heavy rain. During a short period between 8:00 and 9:00 pm MST we received 0.63" - more than fell during the entire month of July. When I walked this morning, it appeared that rain was likely a bit heavier just to our west; regardless, a real rain was hugely appreciated here. This morning's skewT plot for the TWC sounding (above from SPC) continues to show high PW, a much improved vertical wind profile, but with CAPE amounts only small to perhaps moderate for later today. Development of storms at lower elevations will require considerable sunshine, as well as substantial outflow convergence within the BL. The 06 UTC forecast run of the WRF-NAM at Atmo is quite interesting. Most significant storm development is forecast from southwest to north-northwest of eastern Pima county (above forecast of composite radar echoes is valid at 5:00 pm). However, outflows from the western storms and from the Cochise County storms converge and produce evening storms over eastern Pima County - radar forecast below is valid at 8:00 pm. 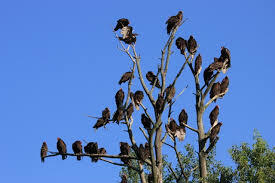 Will be very interesting to watch what evolves later today. When I first saw this image 4:42pm, I said to myself "I've seen that before" but it was just SE of Seattle. We determined that it was a non-tornadic feature (the Seattle case) but yet it looked like it would have had a slow rotation associated with it, a Miso-low? This event occurred a few miles southeast of Seattle about 10 years ago (wow, time flys!) and the first image of the Kitt Peak event reminded me of this one. A dramatic increase in thunderstorm activity yesterday, as shown by plot above of CG flashes through 11:00 pm MST last night (from Vaisala and Atmo). There were several reports of wind damage around the metro area -Atmo had a gust to about 50 mph and we had about the same here at the house. The time-series below is from Atmo and shows the 25 F temperature drop that came with the storm outflow. Across the ALERT network there were 59 sites with measured rainfall (~60 percent) for the 24-hours ending at 6:00 am this morning. There were 18 stations with half an inch or more and 7 stations with more than an inch. The Rillito Wash flowed at some time during the night. Here at the house we had thunder and wind but only a couple of spits of rain - Trace. Plot below shows the 24-hour rainfall for the metro-west sector, where there was a very sharp rain/no rain boundary. This morning skies have mostly cleared (above visible image is from 6:30 am) except to the east, where there is significant cloud cover with a weak inverted trough at 500 mb - this feature will be moving slowly westward across our area today. The morning TWC sounding (below for 12 UTC) shows considerable cooling below 850 mb and considerably less CAPE than was present yesterday. There are northeasterly winds ( not very strong) below 400 mb, so perhaps there will be a bit more storm movement toward the west today. It may take an organized outflow from the east to southeast to get storm development at low elevations. There will be some distinct thermal boundaries playing a role, since soil is very wet in places and bone dry in others. The morning run of the NWS NAM forecasts a wet day for southeast Arizona - bottom panel shows NAM forecast of rainfall through 8:00 pm MST this evening. What's This North Of Kitt Peak? A New Month - Will It Bring More Rain Than July?